For us, there’s no value in delivering attractive products that fall down or break after a few months. That’s why we offer a 3-year warranty on all of our products: we want you to know we have 100% confidence in the build quality of everything we produce. Our warranty covers all issues with the structural integrity of the welding. For over 25 years, our products have stood the test of time. Here at KP Engineering, we’ve been manufacturing, supplying, and installing quality architectural metalwork for over 25 years. For us, the most important thing is that you get exactly what you’re looking for. Thanks to our comprehensive and flexible service, our team always hits the nail on the head. create technical drawings upon order, manufacture everything in-house, and then complete the final installation if required. From start to finish, we put your satisfaction at the centre of our process. Since we handle all manufacturing in our 5000 sq/ft workshop in Wembley, we can be more flexible than our competitors. This includes the wide range of finishing options on all of our products. Got a bespoke project in mind? Share your ideas with our design team and we’ll bring it to life. Please note that since we offer a bespoke service, we never take on more projects than we can deliver using our own workshop. We encourage you to give us a call about any potential projects so we can get them booked in nice and early! then fill in our form and we’ll get back to you with an answer. We are a family business which was established in 1990. We are passionate about steel fabrication with a focus on offering a premium quality product & service to exceed our clients expectations. We operate from a 5000 sq/ft factory in the heart of Wembley’s industrial zone, next door to Wembley Stadium. Our company can supply products for personal and commercial projects. 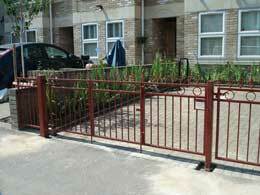 If you have specific requirements for tailor-made railings, wrought iron railings, wrought iron fences, metal railings, metal fencing, garden railings, gates, balustrades, bi-fold gates, barriers, hurdles, palings, balconies, etc then why not give us a call or fill out our request a quote form with product specifics and a member of the team will get back to you. 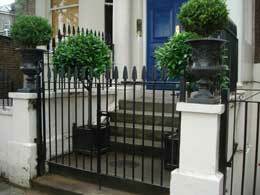 Common throughout London are London style railings which are typically used as a perimeter fence as well as complementing the design of old traditional houses built earlier in the 19th century. Our products are suitable for properties new and old, adding an element of security, perimeter control and stunning design all in one. 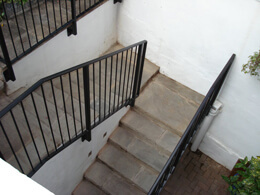 Although the term “wrought iron” is often used when describing a specific type of railing and fencing, the material itself is no longer available. 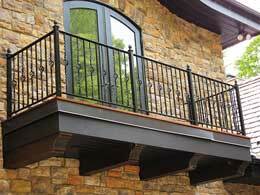 Instead, most wrought iron fences are actually made from a similar substrate known as mild steel. Mild steel contains many similar properties, including excellent malleability and low carbon content, and as it is easier to produce on a mass scale, it began surpassing wrought iron in terms of popularity in the 1970s. Wrought iron is still made for tasks such as restoration and preservation work, but most products such as railings,fences, handrails, gates, and indeed furniture bearing the name are in fact produced using mild steel. London Metal Gates & Railing Manufacturers like KP Engineering can supply to other locations in the UK, if you would like to speak to a member of the team about your enquiry please give us a call or fill out our product enquiry form. Gates and Railings London are our bread and butter products, as such each one has a high level of attention to detail to ensure premium quality & fantastic aesthetic properties are kept at the forefront. 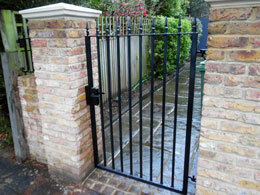 KP Engineering Works Ltd specialises in the manufacture of bespoke Iron Gates London and surrounding areas. We supply beautiful, high quality wrought iron gates to both residential and commercial sectors. Used for a wide range of purposes from security to improved property aesthetics, from schools to commercial properties, they can be used for almost any purpose. Popular applications for our wrought iron gates include: driveway gates and electric opening driveway gates, side entrance gates and courtyard gates. Whatever your requirement may be, we can help, our team puts customers needs at the forefront of each project to deliver a high quality product. 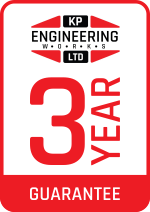 At KP Engineering Works Ltd, we’re proud to supply high quality iron railings to customers across London and the Home Counties. 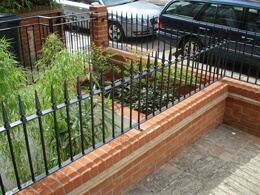 All of our products are made in the UK, including our iron railings. Iron railings can be used for numerous applications, including deterring intruders from your property or just simply increasing the value of your home. 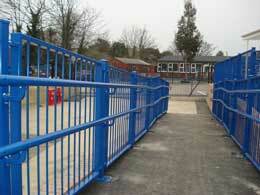 At KP Engineering Works Ltd, we have a wide range of iron railings to suit a variety of requirements. Whether you’re a home owner or a house builder, we serve all markets and industries throughout the Home Counties and London, and strive on turning great ideas into reality. 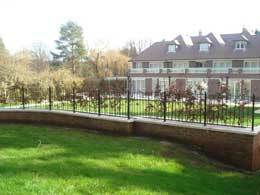 We treat every project as bespoke, and we always provide high quality iron railings to all of our customers. Not only are our iron railings extremely suitable for providing protection to your home, but they can also add a touch of sophistication to the exterior of your home. If you’re interested in our selection of iron railings or just have a few questions, please don’t hesitate to contact us on 020 8903 6599, where a member of our experienced sales team will be happy to help. 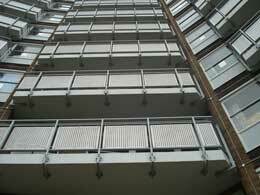 We understand that you may want metalwork provided for a whole host of reasons. Some may be for security measures, to protect your home and your family. Others may be for purely aesthetic reasons, to complete the look of your house and garden. Whatever the reason, we will strive to make your ideas a reality within your budget and time frame, creating high quality products that will last for years to come. We provide many different products and we treat each one as bespoke, so your requests can be made uniquely to you. Below is a list of just a few of our products we create. 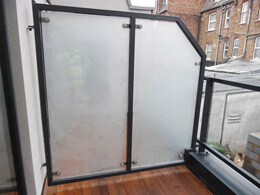 Whether these are for a wall-top, garden, patio, roof terrace or stairway, they can be uniquely fashioned to create whatever look you want, whilst making safety a priority around stairways, patios and roof terraces. These can be a great security measure, making you feel much safer in your own home. 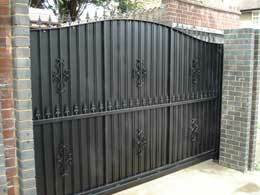 You can have a simple side gate, to keep out passers by or create grand gates to mark the entrance to your property. Security gates are another great way of making sure you don’t have any unwanted tresspassers on your property. 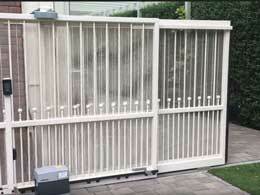 We also offer electrically operated automated gates. 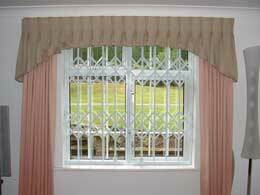 Grilles are another security measure, well worth having. These can be fitted to doors and windows to provide added safety. They can either be fixed or collapsible, meaning you have the option to hide them away behind curtains when not in use or keep them permenantly in place. 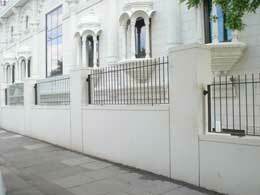 Instead, most wrought iron fences are actually made from a similar substrate known as mild steel. Mild steel contains many similar properties, including excellent malleability and low carbon content, and as it is easier to produce on a mass scale, it began surpassing wrought iron in terms of popularity in the 1970s. Wrought iron is still made for tasks such as restoration and preservation work, but most products such as railings, fences, handrails, gates, and indeed furniture bearing the name are in fact produced using mild steel. A. Many products retain the name “wrought iron”, but as this material is no longer available on a commercial scale, our products are used from an incredibly similar material known as mild steel. Wrought iron was a tough material commonly used in Victorian times to create metal-works such as fencing, and was often hand-worked by blacksmiths. Today, we can still create this bespoke, early-19th century style that is ideal for products like London railings by using the more modern, cost effective mild steel instead. Many products retain the name “wrought iron”, but as this material is no longer available on a commercial scale, our products are used from an incredibly similar material known as mild steel. What other products does KP Engineering offer? 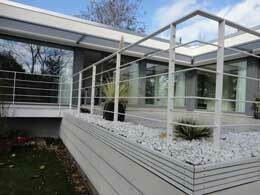 As we are a fabricator, we can design and manufacture a whole range of metal products. Other popular products in growing demand include Victorian Railings, Driveway Gates (electronic and manual), Electric Metal Gates, Reclaimed Cast Iron Railings, Iron Grilles and more! Does KP Engineering offer a Design Service? Yes, here at KP Engineering we can design & produce concepts for custom metalwork / custom gates, railings, doors, balustrades & more. 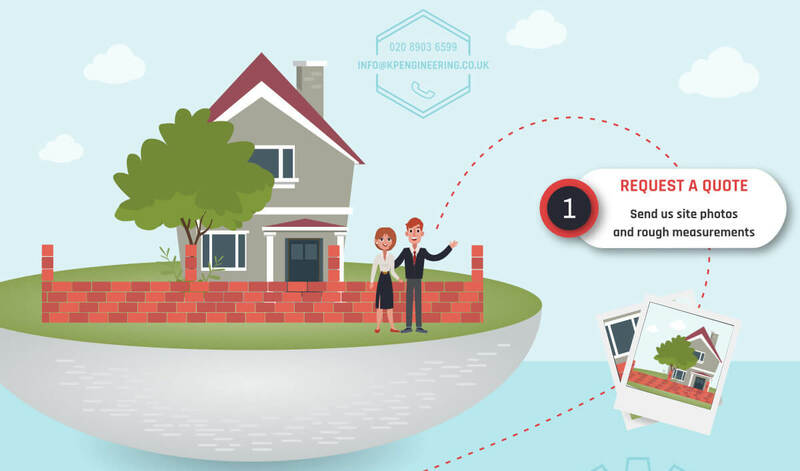 Speak to a member of our team to learn more about our bespoke gate and railing designs & how we can help you to create the perfect fencing, gate or perimeter solution. 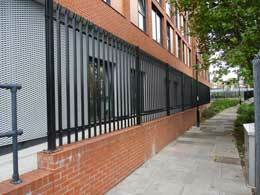 How much do metal gates & railings cost? The prices are entirely dependent on size, style & configuration. We can offer a free no obgliation quote, simply get in contact with us to discuss your requirements. Contact us now if you would like to get a quote for a bespoke product.